Pioneer today unveiled a new car CD tuner, the DEH-P4100SD. Alongside playing the traditional CDs, the well-connected radio also includes an SD card slot, which Pioneer assures us will turn any car into a travelling 'jukebox'. The system also has USB 2.0 technology, so you'll be able to plug most media players into it. Once plugged in, the tuner will display relevant track information on the screen, and you'll have access to things like playlists, via the system's easy-to-use rotary commander. Speaking about the in-car music player, Martin Fuller, Product Manager for Pioneer GB Limited, said, "The DEH-P4100SD is engineered to our renowned standards and is completed with technologies to enhance digital audio. This means you'll enjoy your tracks, in your format, in high quality. 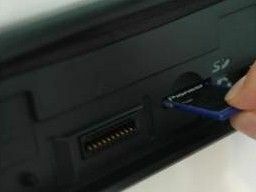 The sleek design of the DEH-P4100SD incorporates an 'invisible' SD slot, it's accessed behind the unit's front panel which is closed again when the card is in place." The CD tuner is available some time in February, with pricing still to be announced.